Your back is a carefully balanced structure that gives your body strength, support and flexibility. Your back supports muscles used to stand, sit and breathe. And it contains nerves that relay important messages between the brain and the rest of the body. 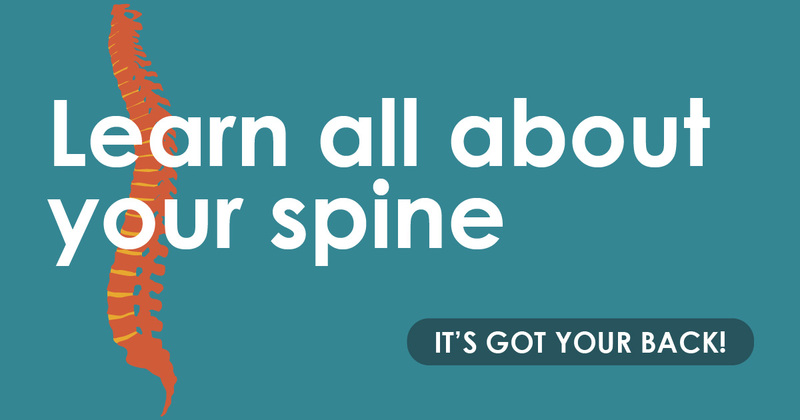 The spine is the centerpiece of your back, serving as an anchor for your shoulders, ribs and pelvis. It also guards the spinal cord. Your spine has gentle and flexible curves that provide strength and balance. The vertebrae are the 33 linked bones that make up your spine. They have rounded bodies with bony projections, called processes, that provide anchors for ligaments and muscles. Holes in each vertebra form a canal for the spinal cord or its extensions. Each of the vertebrae can move a bit, which gives the spine flexibility. The seven cervical vertebrae support the head and neck. They have holes that allow the arteries to connect to the brain. The 12 thoracic vertebrae each support a pair of ribs. Located in the lower back, the five lumbar vertebrae are the largest of the vertebrae and support most of your body's weight. The sacrum connects the spine to the pelvis and the bottom half of the skeleton. At the end of the sacrum is the coccyx (sometimes called the tailbone), which typically is composed of four vertebrae. These lowest segments are usually fused together. These elastic cushions act as shock absorbers for the bones of your spine. They have a fibrous covering that protects their gelatinous core. When you lift something heavy, the core of a disc can bulge out and sometimes rupture. This is called a herniated or "slipped" disc. These provide stability and support for your spine. They work in combination to move your head, neck and shoulders, as well as your torso. They also help maintain the normal curves of your spine. Your spinal cord travels through the spinal column and carries nerve impulses to and from the brain. The impulses follow the spinal nerves that branch out through the spaces between the vertebrae. CHECK OUT THIS USER'S GUIDE TO A STRONG AND HEALTHY BACK.